Christmas at the Falls will open on Thanksgiving night! Santa will arrive on Friday 11/23/18 and will be here nightly through 12/23/18 for pictures with Santa. Santa will NOT be here on Thanksgiving night or the nights after Christmas. 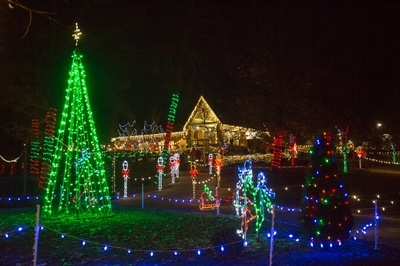 The petting zoo will be open, the train will run, letters for Santa in the General Store, a special light show to music at the covered bridge and millions of lights will be in glow through out the park! All of that for $6 for ages 4 and up and 3 and under are free! Additional cost items will be items from vendors, or our gift shop and you can decorate cookie at the Cookie Workshop at 1 for $3 or 2 for $5. Tickets are on sale at noccalulafallspark.com. Onsite tickets will go on sale at 4 pm nightly, the park will open at 5 pm and the last ticket will be sold at 9 pm. Call 256-549-4663 and press 3 for more information.